Most places of worship, be they churches, cathedrals, synagogues or mosques make me feel intimidated and slightly targeted. I find that churches in particular seem dark and gloomy. The Shri Swaminarayan Mandir however, was quite the opposite. I had never been to a Hindu temple, never really knew much about the religion except for a few basic facts I retained from high school, and so I didn’t quite know what to expect. 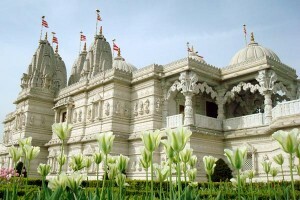 But the mandir with its intricately carved marble and limestone walls was breathtaking. The white stones have a brightening effect, creating an atmosphere optimism and light that I hadn’t found, at least not to the same degree, in any of the churches we have visited so far. The ritual that we observed (feeding the god-statues there afternoon meal) was also different from any religious experienced I had participated in before. I have always felt that in Judaism and Christianity (the religions I am most familiar with) that the music is more chant-like and dreary. The music we heard in the mandir however, was loud and lively and colorful. It was unashamedly celebratory, and I really responded to that. I’m willing to bet that most of Western culture has no real concept of what Hinduism is, what its origins are, or how it is practiced. I was shocked when I learned how the statues are tended. They are fed, tucked in for a nap, and have their clothing changed just as one might a child. This is completely different from my own religious experience where idolatry is prohibited, based on the idea that one should only worship “The God” and that there is only one God. Glad you got something out of it. I’m always impressed at how accepting the Mandir staff and volunteers are to help educate us about their faith and culture.